This blog post was co-authored by Nitasha Verma, Principal Group Enginnering Manager, Azure App Service. In June 2018, we released the App Service Migration Assessment Tool. The Assessment Tool was designed to help customers quickly and easily assess whether a site could be moved to Azure App Service by scanning an externally accessible (HTTP) endpoint. Today we’re pleased to announce the release of an updated version, the App Service Migration Assistant! The new version helps customers and partners move sites identified by the assessment tool by quickly and easily migrating ASP.Net sites to App Service. Assess whether your app is a good candidate for migration by running a scan of its public URL. Download the Migration Assistant to begin your migration. Use the tool to run readiness checks and general assessment of your app’s configuration settings, then migrate your app or site to Azure App Service via the tool. Download the App Service Migration Assistant. 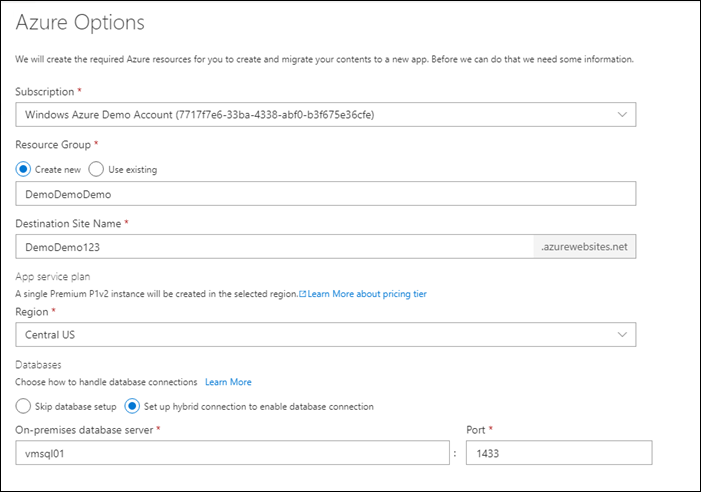 This tool works with iiS version 7.0 and above and will migrate site content and configuration to your Azure App Service subscription using either a new or existing App Service Plan. The Migration Assistant tool is a local agent that performs a detailed assessment and then walks you through the migration process. The tool performs readiness checks as well as a general assessment of the web app’s configuration settings. Once the application has received a successful assessment, the tool will walk you through the process of authenticating with your Azure subscription and then prompt you to provide details on the target account and App Service plan along with other configuration details for the newly migrated site. 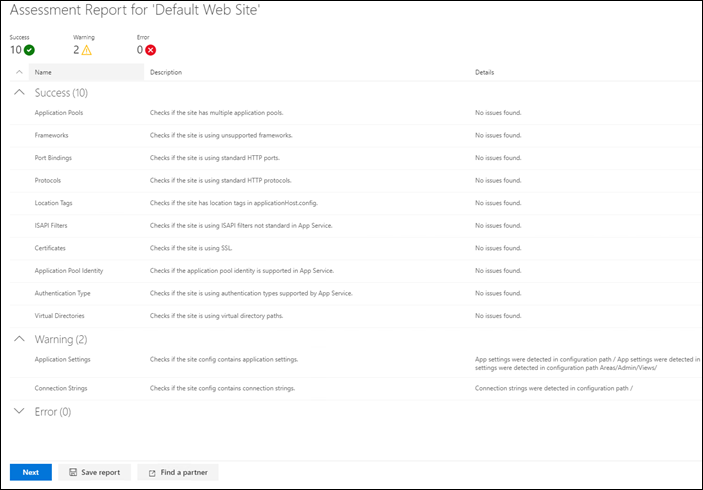 The Migration Assistant tool will then move your site to the target App Service plan while also configuring Hybrid Connections, should that option be selected. 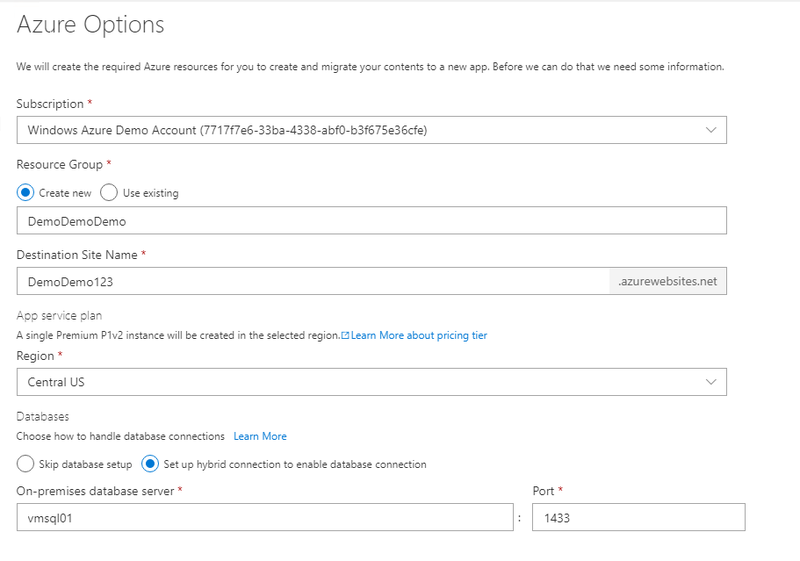 When used with App Service, Hybrid Connections allows you to securely access application resources in other networks – in this case an on-premises SQL database. The migration tool configures and sets up Hybrid Connections for you, allowing you to migrate your site while keeping your database on-premises to be migrated at your leisure. You can find more details on the what the tool supports, as well as workarounds for some unsupported sites on the documentation page. 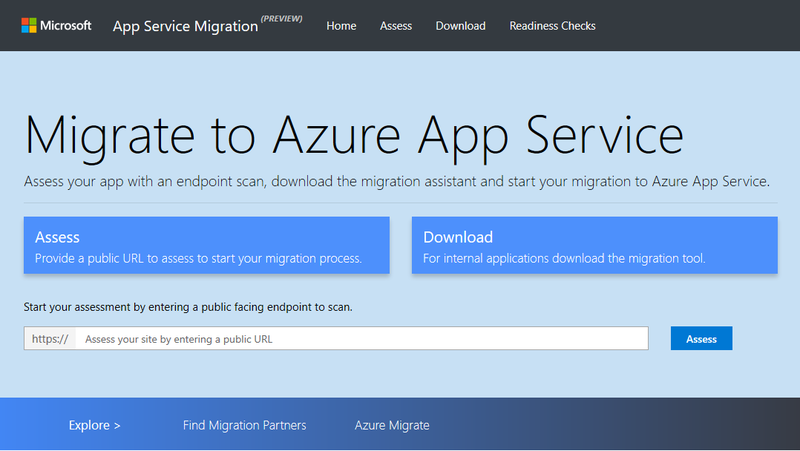 You can also find more details on App Service migrations on the App Service Migration checklist. We plan to continue adding functionally to the tool in the coming months. With the most immediate priority being additional ASP.NET scenarios and support for additional web frameworks, such as Java and PHP. If you have any feedback on the tool or would like to suggest improvements, please submit your feature requests on our GitHub page.